LITTLE ELEPHANT. I saw this sculpture by Fausto Melotti on-line and decided to interpret it into a small art quilt (started in May). Someone must have bought this sculpture, made in brass wire, about 15-inches tall–I can no longer find a picture. Anyway, our Modern Quilt Guild had a speaker last year who used a lot of bias tape, so I decided to make some myself for the basic elephant shape. This is the actual color–for some reason, the color faded out as I zoomed in. It looks like the elephant is spraying water–a happy accident. Before I started quilting, I added elements similar to the original sculpture, using a shisha mirror surrounded by crochet for the eye, a yo-yo, another circle with embroidered lines and colonial knots, and finally one large circle with encrusted beading. I left the front foot loose for dimension. Gotta go–walking with the Bella Vista Walks group at Lake Bella Vista before it gets too hot. 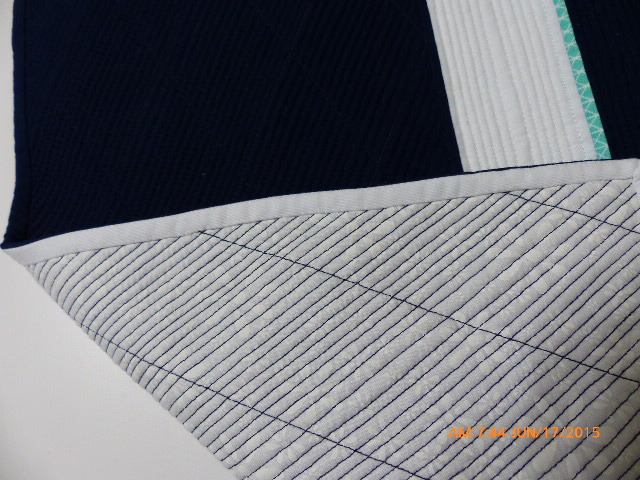 Stay tuned for more quilting hi-jinks. I attended a Blogging 101 workshop on Saturday through the Village Writing School (Eureka Springs) with speaker Jacqueline Wolven. We were actually at the Whole Hog Café in Bentonville where we entered into a heavenly aroma of roasting pork. I have seven pages of word processed notes and a lot of useful information that I can start incorporating, some immediately, some with a little time. My biggest take away was defining myself (I came up with 12 things that define me) and that I need to put some time and effort into my About statement. Here is a direct quote: Most About pages are crap. I can honestly say that mine is and my search for better modeling shows that I am not alone. Another technique I would like to learn is placing a tutorial as a Page on my blog. Of course there are a lot of things I would like to learn, specifically about wordpress, such as linking my blog to Facebook and Pinterest. In my world, you would just press a button; in the real world, it’s more complicated than that, at least according to the wordpress forum. I even tried inserting computer code one day, to no avail. When Alison Taylor-Brown (director of VWS) asked if I had been writing, I answered, no, just writing my blog. She reminded me that that is writing. Well, yes it is. I will share some insights and what works for me in future posts after I have had a chance to digest it all and make some changes. One change I will try to incorporate right away is posting at the same time of day every time. I usually just get on and write my post, edit it at least 10 times and then publish. Today I am using Word to write my post and will upload it to wordpress when I am ready to add photos and publish. This is probably a better way to do this anyway. Sometimes editing in wordpress can be really slow and tedious (especially on the weekend). Do not ask me why. The internet is sometimes artificial intelligence gone bad or there are gremlins or—make up your own reason. Check out the Village Writing School, http://www.villagewritingschool.com/ and Jacqueline Wolven, http://jacquelinewolven.com/. Last night I went to Northwest Arkansas Modern Quilt Guild. We had a fantastic guest who had quite the trunk show. She was entertaining and talented. She is currently using a quilt-as-you-go technique totally on her longarm. It’s pretty amazing. Check out Tia Curtis yourself, tiacurtisquilts.blogspot.com/. Back to last night’s meeting—it was the big reveal for the Cotton+Steel fabric challenge. We each had purchased a baggie of scraps which our leader had brought back from the Cotton+Steel booth at QuiltCon in Austin in February. QuiltCon is an annual modern quilting venue. The only parameters were to use any or all of the scraps and to only add Cotton+Steel fabrics or solids. Because I did not have time to go to Joplin or to mail order, I decided to add solids. The only solids I had that would coordinate with the scraps I was using were blue and white polyester. There are no quilt police in my world so I went with it. Here is my final quilt. 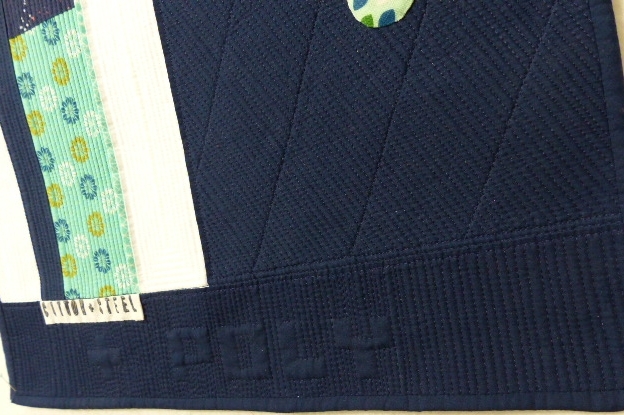 Here is a detail photo of “+ Poly” and the two-fabric binding. and the reverse. There were some wonderful projects–we have a very talented group of quilters. If you are on Facebook, you can see some of the entries on the NWA Modern Quilt page. That’s it for now. I am over the suggested word count is 400-600, so I rolled over my last paragraph to another post. Till next time, stay dry if you’re in the area and find enjoyment in at least some part of your busy day.